Pixelache | Chronophone, Stories wanted! News : Chronophone, Stories wanted! The Chronophone service provided by Unsworn Industries (SE) allows people to call their future selves. You call now and record a message. 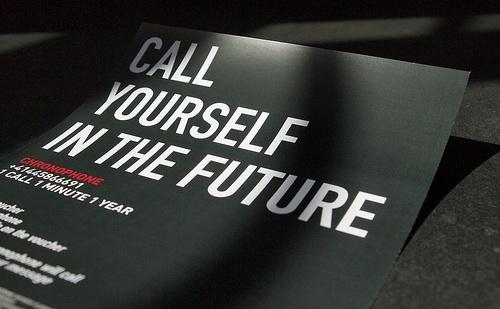 In exactly one year your phone will ring. When you answer you will hear your own voice delivering that message from the past. Chronophone premiered in Finland at Pixelache 2011. Just a few days ago the Swiss branch of the service was launched, in conjunction with the opening of Haus für elektronische Künste Basel. Learning about your Chronophone stories is the greatest reward for Chronophone providers. What would you tell yourself in one year? Perhaps you’ve already used the Chronophone? If you like, you can share your stories here or email them: telecom at unsworn.org. Kiitos, danke, tack!